This entry was posted on Thursday, September 15th, 2011 at 06:36 and is filed under Election 2012, GOP Candidates, Politics, Sarah Palin. 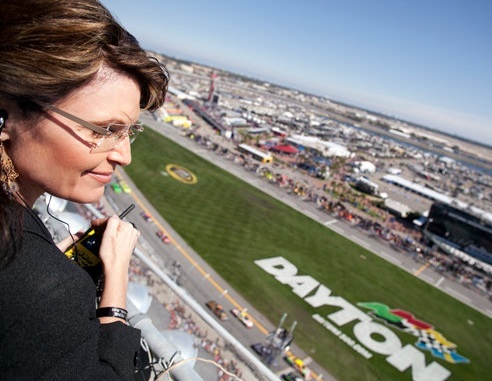 Having been a fan of NASCAR for decades, I’ve noticed what some others may have realized about Sarah Palin, and the importance of timing in official entry into the race for the nomination. Sarah Palin’s been in the race, whether anybody realized it or not, since November 5th, 2008. Her position as McCain’s running mate and the very positive influence she had on the race meant that the party’s base would look to her for leadership in that position unless she openly demurred. After stepping aside from her office in July 2009, Governor Palin began to carry the burgeoning Tea Party’s banner. The Tea Party was born as a reply to Obama’s over-reaching, and Palin’s relation to it merely accentuates the point: She’s exactly the right candidate for America, but to win, she’ll need to consider timing like a NASCAR veteran. It looks as though she has. Have you ever watched a NASCAR race at a super-speedway like the tracks at Daytona or Talledega? These races really come down to a good deal of tactical thinking in the last few laps. First, you must survive the first 490 miles or more to be present for the finish. Through much of the early portions of these races, you will notice generally fewer cautions as drivers are usually very patient. They don’t wish to cause pile-ups early on, or worse, become involved in one, and at speeds exceeding 200 mph at times, it’s really not difficult to upset the carefully balanced racing machines. It’s a test of driver, pit-crew, and machine, but more importantly, the mind. These high-speed tracks are for strategic thinkers. Early, you simply must stay out of harms way, conserving your equipment and fuel, while not permitting yourself to fall too far out of the running. Drivers are generally conservative in the early and middle stages of the race if they hope to be around for the finish. As the laps near the end of the race approach, drivers begin to make much more risky moves. They’re less apt to wait patiently in line, and a specific tactical positioning becomes all-important. If you’re not familiar with NASCAR, or the peculiarities of the super-speedways, generally considered to be the tracks of two miles or greater in some sort of oval configuration, you may not understand why it’s so very important that drivers ride along in line for most of the race. In racing at the high speeds attained at these larger tracks, there is a phenomenon known as “drafting,” whereby two cars nose-to-tail can together go much faster than one car by itself. This is because at those high speeds, one of the biggest limiting factors to going even faster is the resistance of drag from the air the car must punch through in order to go around the track. By lining up tightly, two cars still have the mass of two cars, and the power of two cars, but only the drag of 1-3/4s(approximate.) This means that the two cars together can push to slightly higher speeds, perhaps 5-8% more, but in the vicinity of 200 mph, that’s not insubstantial. The most thoroughly crafty drivers are those who put themselves in the position to be near the front at the end, in order to take advantage of another phenomenon called the “sling-shot.” This consists of using the draft of a partner in front of you to actually gain more speed than the car in front. If you’ve ever passed a large tractor-trailer on the highway at speed, you may have experienced something similar as you found your car being pulled toward the areas of low pressure immediately behind the truck or inside the wake it cuts through the air. This can accelerate you toward the truck, and in a similar way, a skilled driver can use the drafting partner in front of him to gain speed. What the “sling-shot” requires is using this phenomenon in tandem with a wide sweeping break away from the stream, and frequently, a drafting partner or two will fall in behind. The key to carrying this out is timing. If you do it too soon, you’ll have the same thing done to you. If you wait too long, you won’t have the space to get it done, and because you’re not out front, it will be easier to get caught in another driver’s wreck. Timed correctly, this maneuver yields the best chance for success, and in race after race, the people who led most of the way are eclipsed by this maneuver within seconds of the finish. You might wonder why the driver in fourth would go along with the driver in third, and the driver in fifth would go with them. The answer is that in choosing to do so, you increase your chance to finish higher, in this scenario finishing first, second, and third, rather than third, fourth, and fifth. You may ask how this could apply to Sarah Palin. Simply put, despite not being officially in the race, only Palin is in double digits other than the two alleged front-runners. That’s right. She’s sitting in third, and the front-runners have begun to battle side-by-side. In two consecutive debates, Perry and Romney have been hammering one another, and it’s beginning to take its toll. The two are beginning to induce a great deal of drag for their efforts, and the rest of the field will begin to catch up. All that is now required is the momentum of a sling-shot maneuver, and only one person is really positioned to carry it out, but timing will be critical. Great Imagery, I can almost hear the whines. Insightful and inciteful. Thank you, Mark. The scenario you propose with Sarah is a little too complicated to perform – has to many variables to it – & implies that there are others in the race who will help propel her in order to better thier finishing status's, i really doubt anyone of them are willig to help her if for no other reason than doing so CAN"T possibly help them . I think it's more likely she is showing Americans that politics is not supposed to be based on money ( an exorbitant amount of campaigning ) and that shaking up the " status quo " is the first step in doing that ! If they know they are not going to finish in first, the ones directly behind her will push, as most of them would take a VP seat, knowing there will probably be four years of presidency following it. Just as in Nascar…second is not the desired slot, but it is still in the money and worth the effort. Truly great perspective on all of your articles! I have been reading your blog for a few weeks following the link from The Blaze. Excellent!!! Mark, Sarah should hire you to be on her 2012 PR team, if I may say without jumping the gun. I'm serious. You're 100% tuned in to who she is and what she can do for this country. yawn, I like sarah, but its time to put up or stop stirring the pot. Go back to bed. We'll wake you when the job is done.